They say that you should not meet your heroes, because more often than not you'd be disappointed. 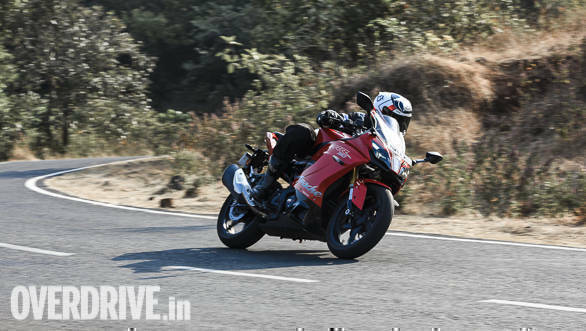 The TVS Apache RR 310 attained that status in my eyes, especially after watching Shumi and Abhay sing praise of its performance at the MMRT. I had high expectations from TVS' new flagship before riding it on the road, in real world conditions. Did it live up to the hype? Let's not beat around the bush here. The Apache RR 310 looks absolutely stunning, especially in this Ducati red (the shade is strikingly similar!) paint job. From the sharp lines on the fairing to the pinched tail section, there's a beautiful mix of form and function. The Apache RR 310 looks special in every sense of the word. To the touch, the quality of the switchgear and plastics feels premium and the overall fit and finish is a new standard for Indian motorcycles. The rider's perch is roomy and with the bars set high and closer to the rider it makes for a sporty yet comfortable riding position. The projector style twin-LED headlamps are adequately bright and offer good visibility in the dark. 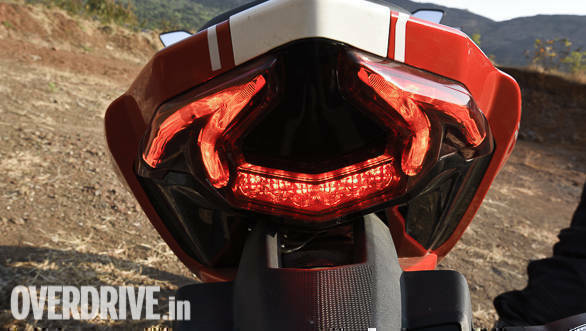 My favourite design element, however, is the shape of the LED tail lamps. The 312cc, liquid-cooled, single- cylinder motor is refined and revs easily to the redline. The 4-valve, DOHC engine produces 34PS at 9,700rpm and 27.3 Nm at 7,700rpm. What I really like about the motor is the ample spread of torque across the rev range. You can potter around the city in sixth at speeds of 40kmph or above and even in heavy traffic engine feels composed at low revs. For a machine that's built to tear up the race track, the motor's tractability is amazing. Whack the throttle open and the RR 310 surges ahead rapidly as you go up the gears. 100kmph form a stand still comes up in 6.7s. It'll also cruise at 110-120kmph all day long, without any fuss which makes it an adept tourer as well. That said, after 130kmph the engine does sound very busy, albeit without being disconcerting. The engine's tractability also results in impressive fuel economy. In the city the Apache returned 33.5kmpl while on the highway this figure goes up to 38.3kmpl. The 41mm Kayaba USD forks at the front and a pre-load adjustable monoshock are setup to offer a plush ride. 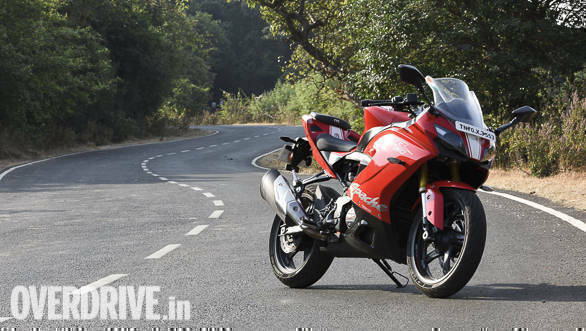 For its intent, the Apache is a deceptively comfy motorcycle, absorbing bumps and potholes with aplomb. Now, one might usually suspect that such a setup is only possible at the cost of handling, but the Apache springs a surprise here as well. The combination of the superb, steel trellis frame and the well-tuned suspension is a motorcycle that's ultra-poised. Tip the motorcycle into the corner and the bike holds an intended line as if on rails. 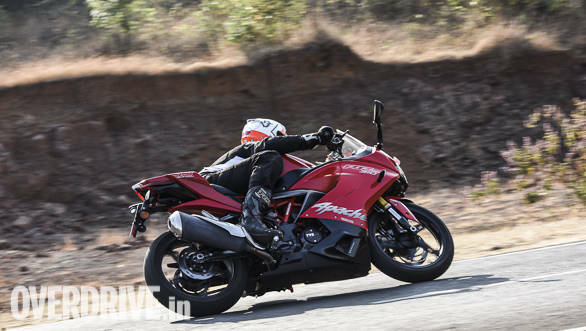 The suspension soaks up mid-corner bumps, ensuring the Apache remains planted throughout the three stages of a corner-entry, mid-corner and exit. This also helps improve the rider's confidence, allowing him/her to whack the throttle open early and get good exit speeds while riding out of the corner. 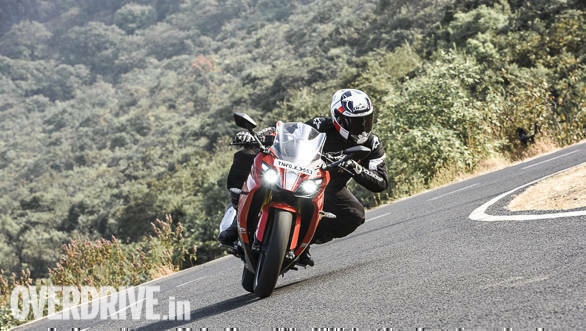 What aids the bike's stability is the the long swing arm (thanks to the reverse inclined engine) and the long 1,365mm wheelbase, be it mid-corner or at really high speeds. What I loved the most is the generous feedback from the chassis and the forgiving nature of the motorcycle. It is really hard to go wrong in a corner with the Apache. The 300mm/240mm disc brakes offer good bite and feedback, however, I wish there was some more initial bite from the front disc and more feel through the brake lever. 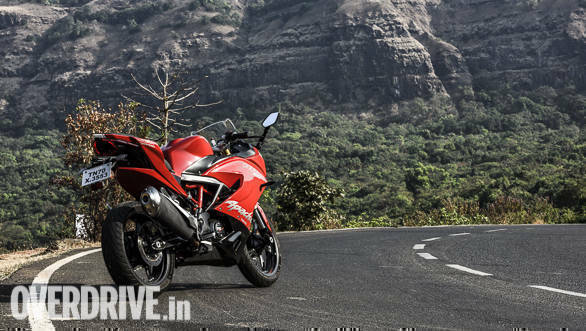 This is the entry-level, super sport motorcycle that India needed. The Apache RR 310 is such a well-rounded product that there's hardly anything to find fault with. If I had to nitpick, you'll feel some vibration in the seat and the fuel tank at certain parts of the rev range but it is not really bothersome. Also, the brakes could do with a little more bite. But, overall, there's no beating the versatility of the Apache RR 310. It'll take you to office without any fuss, thrill you on your weekend ride up a canyon road and plaster a big grin on your face if you take it to the race track, and you must. To me, its surefooted handling and forgiving nature also means that it doubles up as a great learning tool for those stepping up from smaller displacement bikes. 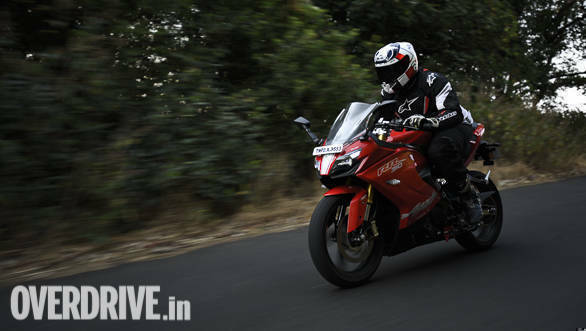 At Rs 2.35 lakh (on-road Mumbai) the Apache RR 310 is definitely worth every rupee.